Ciara was voted the winner of the Food Zone in November 2017. Here she writes about using her prize money to engage school students in an experiment demonstrating the spread of bacteria. If you’d like the chance to win funding for your own public engagement work, apply for the next I’m a Scientist, Get me out of here: imascientist.ie/scientist-apply. Within APC Microbiome Ireland we get the opportunity to visit schools to talk to them about the work we do and complete a couple of fun experiments. With this in mind I used the money to buy some equipment to run experiments when heading out to school visits. The theme of the newest school talk was the immune system and so I wanted to find something that would tie in to this. I decided to purchase a kit which demonstrates the spread of bacteria or viruses from our hands. This kit uses a gel which fluoresces in the UV box. We got some of the children in the class to apply the gel and shake hands, while another group applied the gel and then washed their hands before shaking hands. We were then able to see how the two experiments compared. This fit in nicely to a talk about the immune system as we were able to talk around the importance of hand washing and not sneezing into your hands when you have a cold. The children in the class really enjoyed this experiment and I think it showed them proper hand hygiene. I have been able to visit a number of schools with this experiment and others within the APC have also been able to use the kit to go out on school talks too. I received an update from a school I had visited, showing me what one of their students had written about our visit. I always love attending schools, but I am not always sure if the kids are listening to me but the level of detail from this student’s writing shows that going on school visits really does have an impact. Without my I’m a Scientist winnings this wouldn’t have been possible! 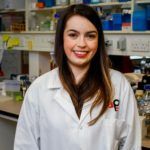 Since I’m a Scientist I have continued to get involved with outreach activities including taking part in Famelab Cork, Fota mad scientist weekend and European researcher’s night. I plan on continuing taking part in outreach activities into the future as much as I can. I have really enjoyed my experience with I’m a Scientist and continue to answer questions in the Careers Zone. I would really recommend it to anyone considering getting involved! ‘I’m a Scientist, Get me out of here’ is a free online event where school students get to meet and interact with scientists. It’s a free X Factor-style competition between scientists, where the students are the judges. Students challenge the scientists over intense, fast-paced, online live CHATs. Then they ASK the scientists all the questions they want to, and VOTE for their favourite scientist to win a prize of €500 to communicate their work with the public.